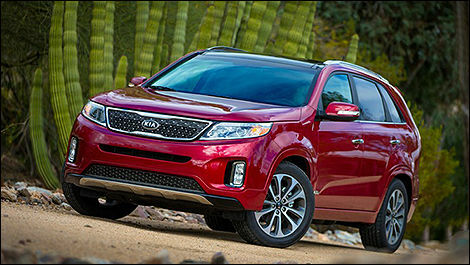 The 2015 Kia Sorento is a sharp-looking midsize CUV with more class and refinement than its logo or base price suggests. It boasts a smooth, powerful V6 engine, and displays good manners on the road. Oh, and Kia’s UVO infotainment system is pretty slick, too. A great pick for families, with plenty of value and available 7-passenger flexibility. On the other hand, the front seats lack padding and the available third-row bench is tight and eats up trunk space. Some will say fuel economy and towing capacity could be better. Buyers have a choice of four models including LX at $26,995, LX-V6 at $29,795, EX at $34,495, and SX at $40,895. Based on Natural Resources Canada’s new 5-cycle testing procedure to determine fuel consumption ratings, expect to burn 11.8/8.5L/100km (city/highway) with the 4-cylinder engine, and 12.9/9.5L with the V6. When selecting all-wheel drive, these ratings jump to 12.3/9.3L and 13.4/9.9L, respectively. Last year the Sorento received an extensive makeover inside and under the hood. For 2015, the Sorento continues with only a few minor improvements designed to make it even more appealing to tech- and fashion-conscious buyers. The front grille is somewhat different, with either an anodized silver metal or black mesh appearance. The lower bumper also has been opened up and gets a cross-hatched intake, while the lights have all been tweaked. For 2015, enhancements to the 4-cylinder engine provide greater fuel efficiency. The 2015 Sorento is offered with an all-aluminum 3.3L GDI V6, which produces a creamy 290 horsepower at 6,400 rpm and a stout 252 lb-ft of torque at 5,200 rpm, as well as a thrifty 2.4L GDI 4-cylinder engine producing 191 horsepower at 6,300 rpm and 181 lb-ft of torque at 4,250 rpm. Power is routed to either the front wheels or, optionally, to all four wheels using an enhanced Torque On Demand all-wheel drive system that seamlessly directs power to the tire with the most traction and now includes Torque Vectoring Cornering Control (TVCC) for added stability under certain driving conditions. A well-sorted 6-speed automatic transmission with manual mode completes the equation. The Sorento’s trunk can hold up to 1,046 litres of gear in 5-passenger configuration, but just 257 litres in 7-passenger configuration. These numbers increase to 2,051 litres when you fold all the rear seats down. The 2015 Kia Sorento comes standard with six airbags, ABS, brake assist, electronic brake force distribution, hill assist control, traction control, and stability control with rollover mitigation. There’s also a back-up warning system that you can complement with a rearview camera. In this segment, you’ll also find the Ford Edge, Hyundai Santa Fe, Dodge Journey, Toyota Highlander, Nissan Murano.